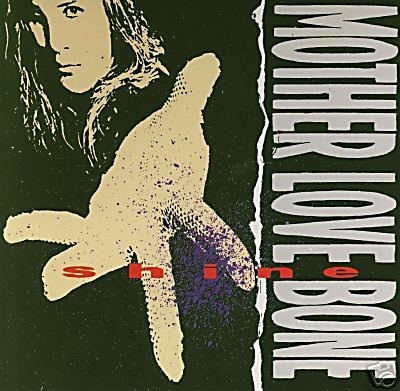 Shine is the debut EP by the American rock band Mother Love Bone. It was released on March 20, 1989 through Stardog/Mercury Records. The EP was recorded in January 1989 at London Bridge Studios in Seattle, Washington with producer Mark Dearnley. The EP was mixed by Dearnley. The EP's cover art was photographed by Charles Peterson. With the exception of the over eight minutes long "Chloe Dancer/Crown of Thorns", a majority of the songs here draw upon the band's rawer side. Vocalist Andrew Wood's dreamy lyrics are sung in a tenor heavily reminiscent of Led Zeppelin frontman Robert Plant. The band became the first of the new crop of Seattle bands to have a release on a major label. The record sold well and rapidly increased the hype surrounding the band. John Book of Allmusic said the "record contributed to the buzz about the Seattle music scene." This whole release was later reissued on the Mother Love Bone (also known as Stardog Champion) compilation album in 1992.